The all new 1984 Mustang SVO came with an air-to-air intercooled, turbocharged, 175hp (at 4400rpm), 2.3 liter, electronic fuel injected, inline 4-cylinder. The Ford Special Vehicle Operations (SVO) group was started on the 1980 Mustangs to to help interested race car drivers build up competition versions of the Mustang, create a kits of bolt-on parts that could be purchased by average Mustang owners to modify their street cars, and create a series of specialty GT racing cars. 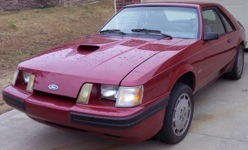 The 1984 SVO Mustang was the first car to do the later. The Ford Special Vehicle Operations (SVO) group was started on the 1980 Mustangs to to help interested race car drivers build up competition versions of the Mustang, create a kits of bolt-on parts that could be purchased by average Mustang owners to modify their street cars, and create a series of specialty GT racing cars. This was the first car to do the later. This car came with an air-to-air intercooled, turbocharged, 175hp (at 4400rpm), 2.3 liter, electronic fuel injected, inline 4-cylinder. Check out this 1984 Mustang SVO hatchback owned by Aaron from Brush Prairie, Washington. It is painted Ferrari Silverstone. Aaron tells us more, "This SVO was sitting for 18 years and passed down to me at the age of 18. I did a complete restoration. It was given to me with the V8 because the 2.3L Turbo had many problems. The rear end is rebuilt being a 8.8 inch with 3.73 gearing. The wheels are also stock." It just rained on this Medium Canyon Red 1984 Mustang SVO coupe with a 175hp (at 4400rpm), 140 cubic inch (2.3 liter), electronic fuel injected, turbo, 4 cylinder engine. Black 1985 Mustang SVO hatchback with a modified 2.3L, 175hp, turbo, 4-cylinder engine.